Map “M15 – Burdett” shows the FLT Main/North Country trail in Schuyler County from NY-14/NY-414 at Watkins Glen State Park Entrance to Gulf Rd. Want a discount? Become a member by joining at our membership page. If you are a current member and have already paid your dues, please add the Paid-up Membership to the cart at no-cost. This will enable your discount. Finger Lakes Trail Conference, Inc. The interactive maps may not display correctly with Internet Explorer. For best results, use Firefox, Chrome or Safari. This is an overview map of the portion of the North Country National Scenic Trail carried on the Finger Lakes Trail System. It shows only the main route of the NCNST; branches, loops, and spurs are not shown. The main FLT trail section is depicted in black for better visibility on various map backgrounds, but blazed in white on the ground. The Onondaga Trail section is depicted in blue and blazed in blue. Trail closures (hunting, logging, etc.) and recommended bypass routes are depicted as shown at right. When you zoom in on a trail section, trailheads, notices, and important infrastructure such as lean-tos are also shown. Pan and zoom with the mouse or by using the controls in the upper left corner. Control the map background using the controls in the upper right corner. Click on trail icons for more information about the feature. Click on the trail to display an elevation profile of that section of the trail. Click the button in the upper right to view the map in the full window. Then click the geolocate button to show your present GPS location on the map. Click for information about FLTC Maps, Loop Maps, Guides and GPS files you can purchase from the FLTC Store. Gray rectangles show the coverage area of each map. Also, connect to Trail Condition Notices directly from the symbols. Trailhead with parking. Click the symbol for more information. GPS coordinates, and for driving directions. Parking prohibited by law or landowner request. Hunting closures. See Hunting Season Schedules for more information. Connections to other long-distance hiking trails. Enter GPS coordinates (Latitude, Longitude) or an address (street address, town, or zip code) and click Find to recenter the map at that location. Click on the center tool to show a small cross-hair in the center of the map. The tool shows the latitude and longitude coordinates of the center if you pan or scroll the map. Select a map background from the list in the upper right. Use the menu icons to find tools to measure distance and control background opacity. The interactive maps may not display correctly with Internet Explorer. For best results, use Firefox, Chrome, Edge, or Safari. If you have a fast computer and fast network connection, you can try the unsegmented Full System version of the map here. This is a overview map of the Finger Lakes Trail System. It shows tracks of the main trail, branch trails, loops and spurs. The track colors represent the blaze colors for the branch trails, loops, spurs, and sections of the main FLT not blazed in white. Most of the main FLT is depicted in black for better visibility on various map backgrounds, but blazed in white on the ground. Trail closures (hunting, logging, etc.) and recommended bypass routes are depicted as shown at right. 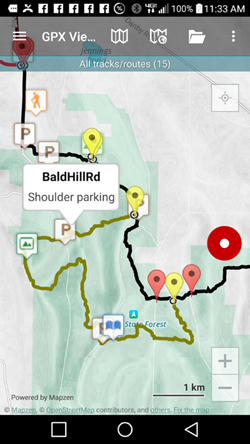 Click on the main trail and branch tracks to display an elevation profile of that section of the trail. ½-mile tickmark – hover over a tickmark to display the mileage along the trail segment (Use Hide/Show Symbols menu to show the tickmarks). The interactive maps may not display correctly with Internet Explorer. For best results, use Firefox, Chrome, Edge, or Safari. If you are having trouble, try the segmented version of the map here. This is an overview map of the Finger Lakes Trail System. It shows tracks of the main trail, branch trails, loops and spurs. The track colors represent the blaze colors for the branch trails, loops, spurs, and sections of the main FLT not blazed in white. Most of the main FLT is depicted in black for better visibility on various map backgrounds, but blazed in white on the ground. Trail closures (hunting, logging, etc.) and recommended bypass routes are depicted as shown at right. Information about FLTC Maps, Loop Maps, Guides and GPS files you can purchase from the FLTC Store. Also, connect to Trail Condition Notices directly from the symbols. Trailhead with parking. Click the symbol for more information and for driving directions. Click on the center tool to show a small cross-hair in the center of the map. The tool shows the coordinates of the center if you pan or scroll the map. Since our trail maintainers don’t visit the trail every day, we depend on you to notice and report trail conditions that need to be corrected. It could be a safety issue or just an inconvenience, but let us know about it. On the other hand, remember that the Finger Lakes Trail is a “primitive footpath” so that some conditions such as a steep rocky section, an occasional “step-over” log, or a section that is muddy in some seasons, are a natural part of the experience. Please submit your trail condition reports by e-mail at [email protected]. If you do not have e-mail, call the FLT Service Center in Mount Morris at (585)658-9320. During times when the office is not open, please leave a voice message with a daytime phone number where we can reach you for more information. FLTC map number(s) – You can find map numbers on the Interactive Map; zoom into the problem area and click on the nearest icon. Direction of travel if important in observing the problem (such as blazing). Give your best estimate of what is needed to correct the problem; we hate to send a crew with chainsaws only to find a small tree that could have been handled by one person with a handsaw. Are my paper maps, PDF files, and GPX files up to date? We revise paper maps, PDF files, and GPX files when trail conditions change significantly. When we do, we change the Revision Date of the map. We also apply minor updates to our maps as needed, and for these, we do not change the Revision Date. For all map changes, we post a Map Revision Notice on the Trail Condition Notices page on the website. You can use both the revision date and the Map Revision Notices to decide if you want to purchase a fresh copy of a map. We do not change our maps for temporary conditions such as logging closures, storm damage, or special events, but we do post Trail Condition Notices. On the Interactive Map hover over the FLT icons ( or ) to display the revision date. Click on the icon ❶ to see more information about the map. Click on the link ❷ to display the trail condition notices for the map. On the Trail Condition Notices with the sorting option set to “Map,” click on the map name to jump to the trail notices ❶ for that map. Then look in the heading for the map for a description of the map and the latest revision date ❷. Also, check for Map Revision Notices ❸ shaded in pink. In the On-line map store hover over a map rectangle ❶ on the Select your own map set page. 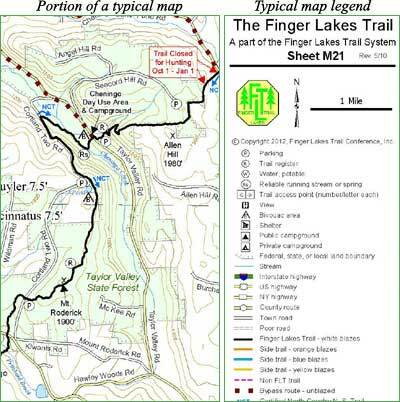 We hope that this information will help you keep your maps and understanding of trail conditions up to date for the most satisfying and safe experience on the Finger Lakes Trail. The FLTC offers downloadable files containing complete track and complete waypoint GPS data detailing all of the approximately 1,000 miles of the FLT, including main, loop, branch, and spur trails. In addition to GPS data, the downloadable files contain PDF images of the paper maps. GPS data is in the form of GPX files that can be loaded onto smart phones supporting GPX apps. The free GPX Viewer from Vectura will enable you to view our maps on your Android phone. Tracks and waypoints are displayed on a variety of on-line map backgrounds along with your present location. GPX Viewer Pro (license fee) has all of the features of GPX Viewer plus you can record the track of your hike. You can also download background maps to your device that can be viewed during your hike even if you have no cell phone coverage. If you have experience using other smart phone apps, please let us know at [email protected]. The FLTC offers downloadable files containing complete track and complete waypoint GPS data detailing all of the approximately 1,000 miles of the FLT, including main, loop, branch, and spur trails. In addition to GPX data, the downloadable files contain PDF images of the paper maps. GPX files can be loaded onto color “field” (i.e. hiking, as opposed to automotive) GPS units. 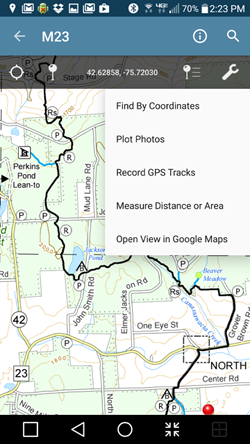 These GPX files can also be opened in Google Earth, so that you can view your hikes ahead of time (you can download the necessary software from Google Earth for free). Detailed instructions for using the Track and Waypoint data in these GPX files are provided here. Recent Garmin units: 62, 78, Oregon, Dakota, and Colorado. The Oregon and Dakota models are “touch screen” units (similar to auto GPS units) amd may be a little easier to learn how to use. Advantages: Can hold 200 loaded (saved) tracks of up to 10,000 track points each, slicker interfaces to work with, can load in aerial imagery (Google Earth in your hand) at $30/year. Disadvantages: More expensive, loaded (saved) tracks do not retain track colors and are not turned on by default (but we’re hoping a future update with Garmin WebUpdater will fix these two problems). Older Garmin units: 60, 78 (instructions can also be used with Etrex Vista HCx and Etrex Legend HCx with slight modifications). Advantages: Less expensive, loaded (saved) tracks retain track colors and are turned on by default. Disadvantages: Can hold only 20 loaded (saved) tracks of only 500 track points each (but tracks we sell are filtered down to this level), these models may soon be discontinued, Etrex models mentioned above can be quite inaccurate if oriented vertically. Bottom Line Recommended Unit? If you are a “techie” and can find it, grab the 60CSx at the present discounted prices. If you are a “newbie” you might prefer the touch screen Dakota or Oregon units (the Oregon 550 models can also take geotagged [lat-long embedded] photos). Unless you have one of the recent Garmin units that has preloaded topo maps (indicated with a “t” at the end of the model number) you will want to download free topo maps for Garmin GPS units from GPS File Depot or other web sites. You can also purchase Garmin Topo U.S. 100K or similar Garmin software on DVD or micro SD card, but these can be expensive. Delorme Units: These data also work with the Delorme GPS units PN-20 and PN-40, if you also have Delorme Topo software. However, expect loss of track and waypoint attributes (such as colors and symbols) with these and other GPS units that are not in the above recommended list. Other Units: These GPX files may be compatible with other GPS units, but we have tested these files only with the recommended units listed above. If you are using another unit, it is up to you to determine that your GPS unit can use this GPX data. Before ordering the digital download map files, try downloading this sample GPX file, M09.gpx (our map M9), to ensure that it is compatible with your hardware and software. PDF map files available for download from the FLTC On-line Store are geospatial-enabled. This means that the files can be imported into mapping software available for many Apple and Android smart phones and tablets, and soon for Windows Phones. We have tested our PDF maps with the Avenza PDF Maps Mobile App. Once you have installed this (free) app on your device, you can import the FLTC PDF map into the application. The free version of the Avenza app will only permit you to import three maps at one time. To import an additional map, you must first remove one of the three. You can still keep the PDF files on your device and switch them at any time. There is a subscription version available from Avenza that will permit you to import an unlimited number of maps. NOTICE: We are aware that some of our maps may not work correctly with Avenza Maps since the app is not able to handle maps with more than one geoposition space. Some of our maps have small insets to show additional detail and these insets confuse Avenza. It appears that Map M01 does not work. M16 has worked OK on an Android device. We do not have information on maps M08, M19, and O1 which all have insets. All other maps should work correctly. Please let us know if you have difficulty with our PDF maps with Avenza Maps or any other apps. Download a sample map in PDF form here. As a Local Work Crew member you will join other volunteers recruited to work on trail projects that are beyond routine maintenance and the capabilities of the individual trail section adopter/steward. Projects might be repairing trail erosion, clearing downed trees, repairing bridges and structures, and the like. Projects are usually one day or less. Work parties are typically organized by the club or organization sponsoring the section or by the FLTC’s Regional Trail Coordinator for the area. Many of our Local Work Crew members also have their own trail section they maintain. Trail work projects are announced by e-mail and by local websites and newsletters. Let your trails chairperson, trail sponsor, or regional trail coordinator know if you will join the crew as this will greatly help with planning. Your trails chairperson, trail sponsor, or regional trail coordinator will be responsible for reporting total hours of trail work, drive time, and administrative time. To join your local trail work crew, simply contact your trails chairperson, trail sponsor, or regional trail coordinator and get your name on the distribution list. As a trail section Adopter/Steward you assume responsibility for a section of the Finger Lakes Trail, generally 1 or 2 miles in length. Working for your club or trail sponsoring organization, or as an individual trail sponsor under one of the FLTC’s volunteer Regional Trail Coordinators, you agree to visit your section three times per year. You perform routine inspection and maintenance: clear vegetation and fallen branches, pickup litter, refresh blazes and signs as needed, check up on trail infrastructure such as register boxes, benches, bridges, lean-tos, etc. To access the services of a roving certified chainsaw operator or for anything else you can’t handle yourself, you will contact your club or organization’s trails chairperson, or the FLTC’s Regional Trail Coordinator who oversees your area. They will help you organize a work day with a local work crew. You will keep a log of your activities and report total hours of trail work, drive time, and administrative work, and report it to your trails chairperson or sponsor. You will also be invited to attend occasional training meetings in your region. Consult with this page for notices of trail conditions before you leave for your hike. Click on the “Sort by” option to sort the notices by map name or by date. Don’t know your map name? Go to the index map look for the name (M09 for example) nearest your hike location. When sorted by map name, the notices are listed going from west to east on the main trail, and then north to south on the branch trails (south to north on Conservation and Onondaga trails). Click on the map names above the table to jump to the notices for a particular map. You can then scroll up and down to view other nearby notices. 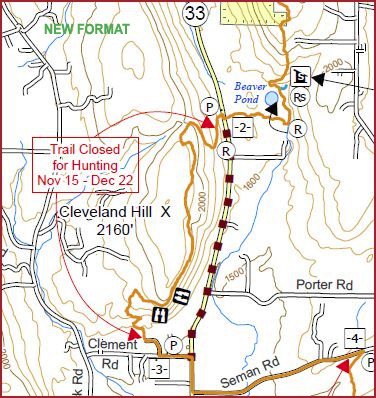 Map names in red indicate that one or more notices for that map contain hunting notices or other temporary trail closures. Check carefully for these notices during hunting season(s) in your area. Map names with a line through have no notices. The date of the most recent major revision is shown for each map. Check the revision date on your map to see if it might be outdated. All changes to maps—both major revisions and minor updates—are reported as Trail Notices highlighted in pink. Use these notices to decide when you want to replace an outdated map. When sorted by Date the notices are listed with the most recent notices anywhere on the FLTC system listed first. Some older notices have been archived as they may contain information that is still useful if you have not visited the trail recently. Click the “Archived” link to view these notices. Trail conditions change frequently. You can help by reporting problems you see. But please read How to Report Trail Conditions before submitting your report. Trail Conditions are posted when reported and verified. Conditions are rectified if and when volunteers are available. The FLT is a “primitive footpath.” If you are looking for a smooth, easy “walk in the park” then you might prefer a park for your walking. On the other hand, if you are looking to challenge yourself and get away from “engineered” experiences, then come to the Finger Lakes Trail. Nevertheless, we want the condition of the Finger Lakes Trail to be the best it can be. Every section of the trail is maintained by stewards and trail adopters who are members of the FLTC and affiliate clubs and organizations. These people volunteer their time because they care about the Finger Lakes Trail. They also care about your experience on the trail. They visit their section of trail several times each year to look for problems: trail erosion, litter, vegetation infringement on the trail, fallen trees and branches, blazes and signs that need to be replaced or refreshed, and infrastructure that needs repair. In short, they look for things that will interfere with your wilderness hiking experience. Trail volunteers also interact with our private landowners who have agreed to share a portion of their property with FLT hikers. Our volunteers are the first to know when land ownership may change, or when the landowner has had a problem on their section of trail. Whether you are a new or experienced hiker, if you find a problem on the trail, let us know! Visit the Trail Condition Reporting page for more information. Remember, some sections of the trail are closed during hunting seasons which include Spring and Fall turkey seasons, and Fall big game seasons. Closures are listed in red in the Trail Condition Notices. Dates are listed on Hunting Season Schedules. And, when you are ready, join us as a volunteer to help keep the Finger Lakes Trail one of the best hiking trails in the world.